I had Friday night on my calendar as a game to attend for the longest time as I figured it would be a Clayton Kershaw start, being the first game after the AllStar break. An ideal opportunity for a Dodger win. All the stars were aligned for it to be the perfect road game to see in person. But I couldn't pull the trigger. I had to wait, and I'm sure glad I did. In the end, when the Dodgers announced that Bolsinger would start, I didn't buy tickets. In this age of modern technology, you'd think that a Major League organization with a stadium a mere 7 years old could keep the lights on. But now, as a D.C. resident for the last 15 months, I must say, nothing surprises me in the nation's capital. Chalk up the Friday-Saturday loss on the Nationals to an inept stadium staff. They single-handidly gave their ball club a victory by forcing pitchers to warm up and cool down for a three hour period. Why in the world the game wasn't played under protest is beyond me. Tsao gave up the 2-run homer on Friday night after having warmed up and cooled down twice. The third time, he clearly wasn't ready. As I watched this debacle from home after the lights went out a second time, I couldn't help but think, "thank goodness you didn't attend this train wreck in person." What a mess that was and an embarrassment for the Nationals organization. That delay should have been no more than a few seconds, and not hours on end. 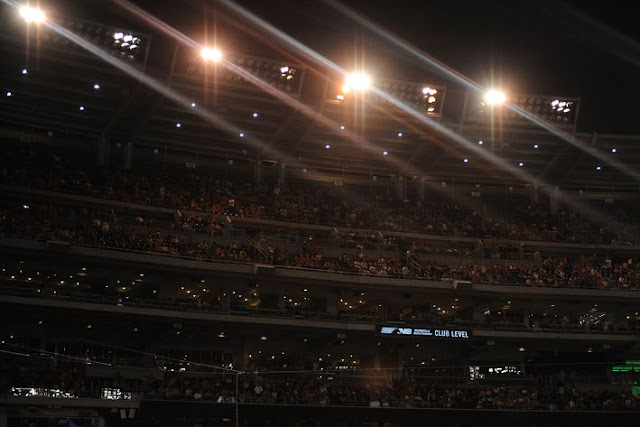 I'm obviously not savvy about technical issues, such as stadium lights, but it seems that there are enough out there in 29 other cities, (oops, make that 28, as I forgot about Chicago), that know how to keep them on without jeopardizing the integrity of the game. If I had attended the game on Friday, I'd be asking for a full refund. 17 innings pitched, 0 Runs Allowed, 27 strikeouts, 0 walks. Small sample size? Sure. Has anyone had such a dominant two game stretch in the past few decades? I doubt it. Twenty-seven Ks and 0 walks. Nobody does that in two games. Last night's Game Score of "90" was Clayton's highest since he pitched that no-hitter last year on June 18th vs. Colorado, with a games score of "102." 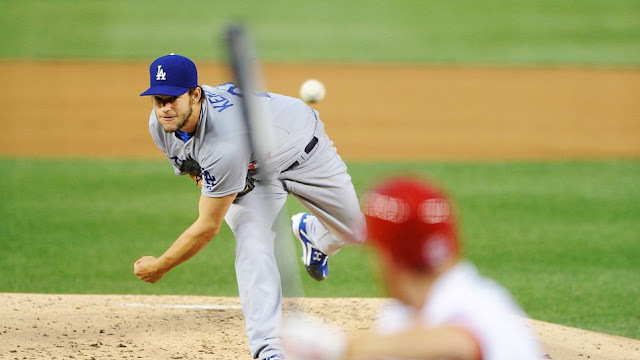 (Kershaw's no-hitter was the 7th highest game score in major league history and even surpassed Koufax's perfect game of "101"). That Bill James devised sabermetric stat (game score) is probably the best measure of game greatness out there for pitchers. A score of 90 or higher makes up less than 0.025 % of all games played. Kershaw has thrown 4 of them in his career, and yesterday was one of them. He's the best pitcher in baseball bar none. Watch him roll off 12 wins in a row. I'm calling it right here. How to calculate "Game Score:"
Add one point for each out recorded, so three points for every complete inning pitched. Add two points for each inning completed after the fourth. Add one point for each strikeout. Subtract two points for each hit allowed. Subtract four points for each earned run allowed. Subtract two points for each unearned run allowed. Subtract one point for each walk. The moment has arrived. 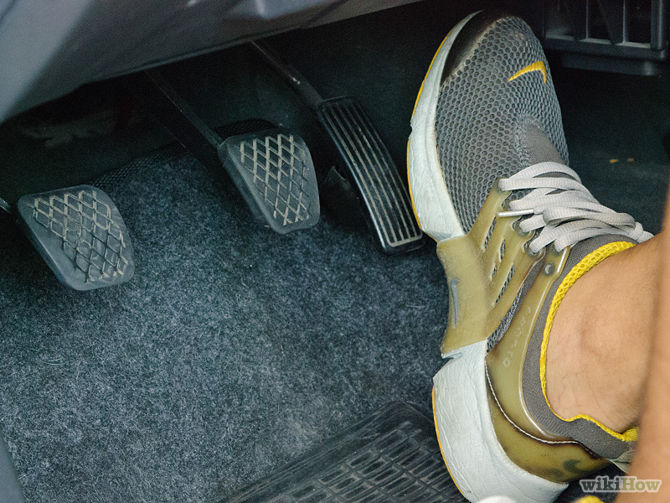 The Dodgers need to step on the accelerator. Everything is lining up in order. The Giants are slumping on the road and now they head to D.C. to face a tough Nationals team. The Dodgers are coming off their first off day in over a month as well their first winning road trip of the season. They have a homestand coming up in which the schedule favors them with inferior teams, (Mets, Phillies and Brewers) and to top it off...Kershaw and Greinke start the first two games. There comes a time in a season when you simply have to step on the gas and cushion that lead. NOW IS THAT TIME! As much as the Dodgers have pretty much led the division from the get go, it's safe to say that this team hasn't dominated by any stretch of the imagination. If you want to see what this team is truly made of, I say this is the week we'll find out. The Dodgers need to enter the All Star break with a 6 or 7 game lead in the West. This has been a strange year. With the Giants owning the Dodgers in head to head play, it reminds me of a similar situation of Dodger-Giant lore, but things were the exact opposite in 1971. This was a Dodger team of Richie Allen, Willie Davis, Wes Parker and Maury Wills' last good season. Al Downing won 20 games and Don Sutton 17. Jim Brewer in the pen sported a 1.88 ERA. 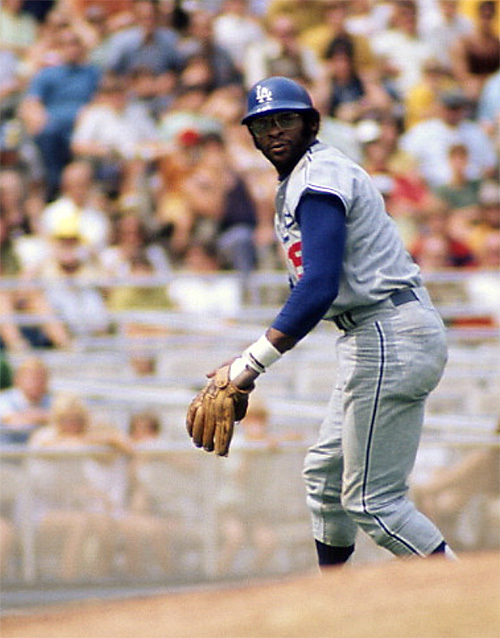 Richie Allen at 3B for the Dodgers in 1971 made Pedro Guerrero look like a gold glover. The Dodgers absolutely owned the Giants that year, but San Francisco started out hot and they were in first place for 147 days of the season, almost from start to finish. L.A. had a 12-6 record against the Giants that season, including winning their final eight contests with their hated rivals. We all knew who the better team was. It just seemed inevitable that San Francisco would cough up that 10 game lead they had as the Dodgers whittled away at it to move within one game of first place on September 14th. Unfortunately, the Dodger schedule against San Francisco was done by then. A four game losing streak to hapless San Diego and Atlanta set them back. Even winning five of their final six wasn't enough as the Giants held their own and won the division by one game, depriving us of what would have been a classic NLCS with Roberto Clemente's Pittsburgh Pirates. It doesn't matter who the wins and losses come against. The big picture right now is the overall record, and as things stand right now, the Dodgers beat the teams they should beat, much better than the Giants do. We know the Giants and Cardinals have owned us this year, but those were just blips on the whole schedule. The '88 Dodgers were 1-10 against the Mets in the regular season, but that didn't matter when the NLCS rolled around. The '83 Phillies were 1-11 against the Dodgers, but when the playoffs came around, and they took the Dodgers out in 4 games. We express concerns with the way this team holds up against those NL rivals, but it's a clean slate in October. There's a lot of time left. There is a trade deadline looming and some exciting call ups coming for the September run. This ball club will be a completely different animal in September. And so will the Giants. For that reason, getting a cushion at the All Star break is very important. Not crucial, but certainly important.